This is how bored i am.....ive done a painting! While watching old school Degrassi High....Awesome show! Its Carlton from Fresh Prince of Bel Air! My room is badly lit but its blue on a white canvas. 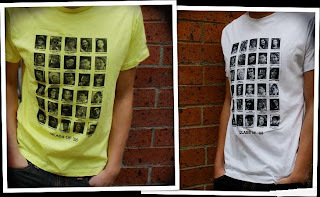 Degrassi class of 88' t-shirt! Forgot about the old blog so started a new one. Hopefully more interesting than the other. Waahhhh YSL why you so expensive. I need to do something with my hair...so black...so boring...blah. I don't mind the black part so much just the lack of life. All one length and too much volume. May go back to African roots and let it be a wild jungle of natural curls again....yeah! Life is well boring at the mo. Jobless but have oh so much time to do what i want! Will wear red lipstick more often to make life more interesting.